Following the expulsion of the Chinese regime’s former security czar, Zhou Yongkang, in December last year, 521 of his associates were arrested and another 13 escaped overseas, according to a top-level internal memo of the regime passed down to the provincial level on Nov. 12, Hong Kong-based Chengming Magazine reported. Among the 13 fugitives, Zhou’s mistress Liu Yingxia is a key witness for his case. The process of taking down Zhou and his associates involves “five major battles,” spanning various government divisions where Zhou worked, according to the regime’s mouthpiece People’s Forum. Among the 13 fugitives, the memo lists Zhou’s mistress Liu Yingxia, a key witness in his case. She is a former member of the Chinese People’s Political Consultative Conference and the deputy Chairperson of All-China Federation of Industry & Commerce. as well as the CEO and director of the board of the Xiangying Group. Liu was ranked the No. 31 richest person in the Hurun China Female Rich list in 2008 for having over two billion RMB Yuan (US$320 million). Apparently, Liu also has close ties with Wang Gang, the former director of General Office of the regime’s Central Committee during Jiang Zemin’s rule, and Jiang Jiemin, who was arrested in 2013. 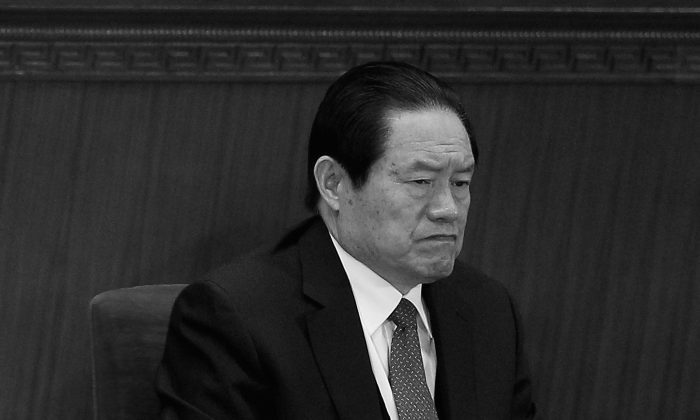 Jiang Jiemin was the chairman of PetroChina from May 2007 to March 2013, and also headed PetroChina’s parent company, the China National Petroleum Corporation (CNPC), and is a close ally of Zhou Yongkang. Another key person on the run, according to the memo, is Jia Xiaoxia, also known as Margaret Jia. She is the younger sister of Zhou’s second wife, Jia Xiaohua, who is a TV program host for state-run CCTV, Jia Xiaoxia was swiftly promoted to the position of deputy general manager of CNPC International (Canada) after her sister married Zhou. She has seldom made any public appearances since the sister lost her freedom in November 2013, and her 21-year-old son John Jia has been banned from leaving China. Asian Weekly reported that, Zhou had at least 29 mistresses, including a famous singer, Tang Can, who is believed to be a senior colonel in the military. It’s also rumored that Tang was a shared mistresses among Zhou’s gang, such as: Bo Xilai, former Chongqing Municipal party chief; Xu Caihou, former Vice Chairman of the Central Military Commission; and Li Dongsheng, former deputy director of the Leadership Team for handling the persecution of the Falun Gong meditation group. In 2011, Tang suddenly disappeared. Translation by Tan Hohua. Read the original Chinese article here.